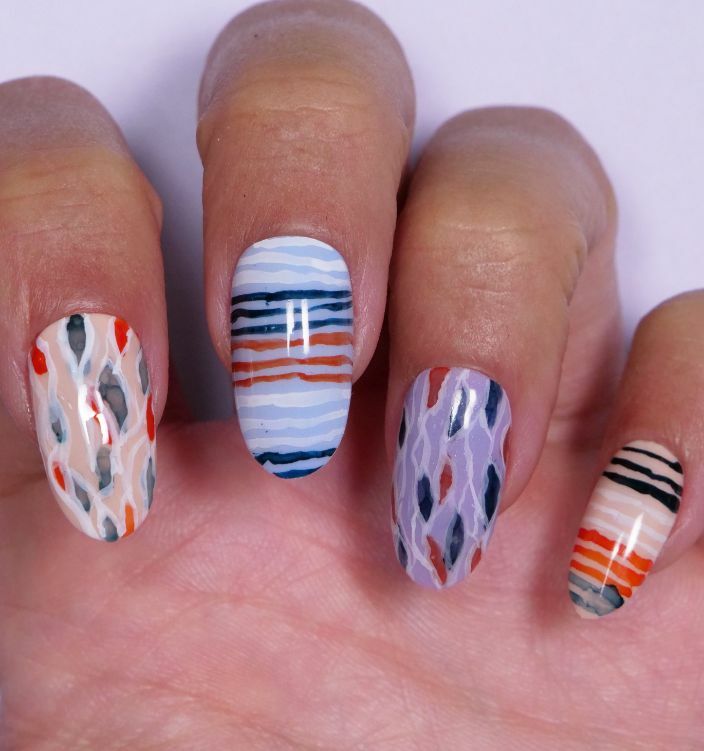 If you're tired of one-note nails and are ready to venture outside the box, then this manicure may be right up your alley. In color theory, blue and orange are on opposite sides of the color wheel. Although they may seem like polar opposites, these two colors are known as complementary colors. In short, they're often paired to create contrast and drama. Because a blue and orange manicure might seem too bold, these hues are set against a pale peach background and outlined with white. These additional colors mute the overall design to soften the contrast. Using alcohol ink makes the colors more translucent so the pairing doesn't seem too harsh. 1. Apply two coats of peach gel polish to the nails, curing them in between coats with the UV or LED lamp. 2. Apply one coat of matte no wipe gel top coat to the nails, and cure it with the lamp. 3. Place drops of black and blue alcohol ink on a pad of Extreme Post-it notes, and mix the two colors together with a toothpick. 4. Place drops of white and orange alcohol ink on the same Post-it note, but don't mix them together. 5. Pour isopropyl alcohol into a glass jar or dish. 6. Dip a nail art brush into the alcohol and then into the mixture of blue and black. Paint several short, wavy lines on the nails. 7. Clean the brush by wiping it against a paper towel. 8. Dip the brush into the alcohol and then into the orange ink. Draw orange squiggles on the nails, and cure the ink with the lamp. 9. Apply one layer of matte gel top coat to the nails, and cure the gel with the lamp. 10. Dip the brush into the white ink, and draw lines around each wavy line and squiggle. Cure the ink with the lamp briefly. 11. 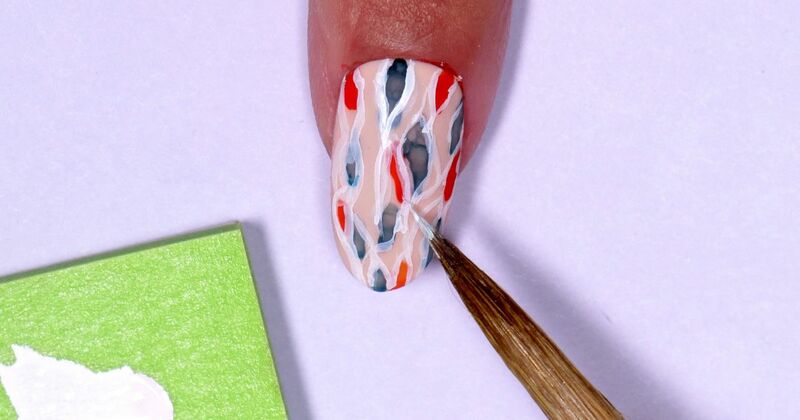 Seal the design by applying a layer of no wipe gel top coat, and cure the gel once more.